Flickers readily use nestboxes - the trick is preventing starlings from taking over the box. 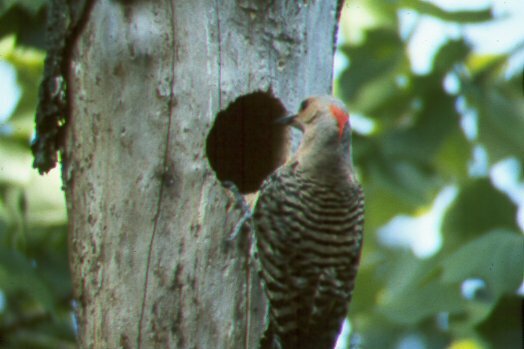 Woodpeckers need to excavate their own nest, so many people fill the nestbox with wood chips, allowing the flicker to then remove the chips. Flickers seem to have no problem with this, however, when I tried it, I found that starlings also quite readily removed the wood chips. Instead, I save pieces of softened wood from our wood pile (just beginning to rot), and saw them into blocks the size to fit into the top opening flicker box. These inserts provide soft wood for the flicker to excavate, but are too difficult for the starling to peck out. The inserts can often be turned around after the first year's use (if your box is square) and used for two or even three years. I have, also, fitted solenoid controlled starling traps on the flicker box and trapped any starling that has decided to use one of these boxes. 2004 update My source for the small wood chips used in flicker boxes is usually from my belt driven planer. I do not recommend using saw dust. On two occasions, I have observed flickers trying to remove sawdust that was packed in their box. They would poke their head out the entrance and shake it violently, then rub the side of their beak on the box, and sometimes appear to "spit", with very little sawdust appearing. This would be repeated hundreds of times. In excavating a natural cavity, the flicker makes small chips, and this is what it can easily remove from the box. Also, don't use hand plane shavings or anything else that will not easily pack down or support the eggs. 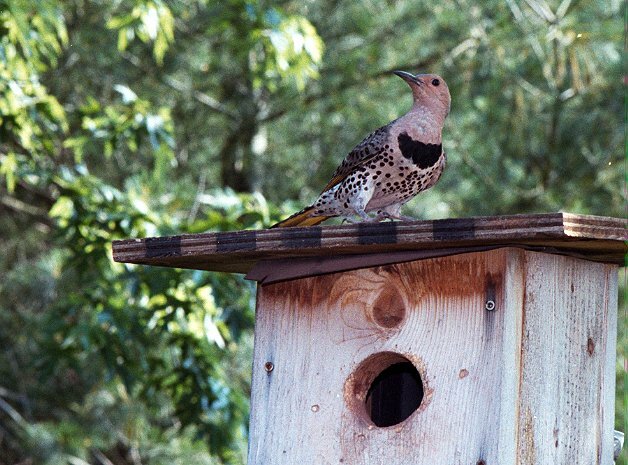 April 2005 update In the past three years, it has become abundantly clear that European starlings are causing repeated nesting failures in our resident northern flicker population. I hope to provide additional observations of this on one of the trap pages, as time allows. 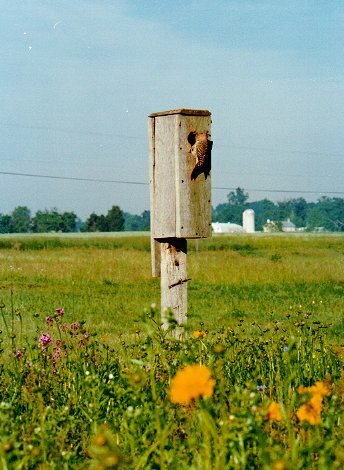 A flicker box with starling trap. When in use, a solenoid is fitted on the side of the box and controlled from a blind or vehicle. Flicker nest in a backyard snag. A 6' section of a dead hickory tree was brought to the yard and wired upright to a post set in the ground for this purpose. 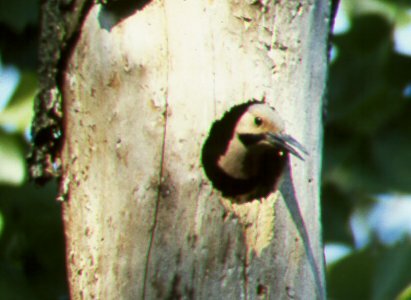 2010 northern flicker nesting Successful!